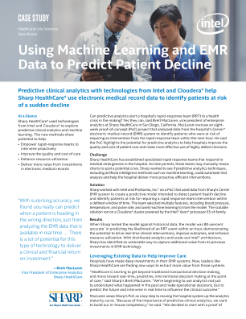 Can predictive analytics alert a hospital's rapid-response team (RRT) to a health crisis in the making? Yes they can, said Brett MacLaren, vice president of enterprise analytics at Sharp HealthCare in San Diego, ...California. MacLaren oversaw an eight week proof-of-concept (PoC) project that analyzed data from the hospital's Cerner* electronic medical record (EMR) system to identify patients who were at risk of requiring an intervention from the rapid response team within the next hour. He said the PoC highlights the potential for predictive analytics to help hospitals improve the quality and cost of patient care and make more eﬀective use of highly skilled clinicians. Sharp HealthCare has established specialized rapid response teams that respond to medical emergencies in the hospital. As time permits, these teams may manually review charts to spot a potential crisis. Sharp wanted to see if predictive analytics techniques, including artificial intelligence methods such as machine learning, could automate that analysis and help the hospital deliver more proactive, efficient interventions. Sharp worked with Intel and ProKarma, Inc.* on a PoC that used data from Sharp's Cerner EMR system to create a predictive model intended to detect patient health decline and identify patients at risk for requiring a rapid response team intervention within a defined window of time. The team selected multiple features, including blood pressure, temperature, and pulse rate, and used machine learning to train the model. The scalable solution ran on a Cloudera* cluster powered by the Intel® Xeon® processor E5 v4 family. Intel spent a day with nurse practitioner, Ginger Harris, as she went on home visits with a new Ultrabook.